Anyone who's ever had a breakup has probably experienced the uneasy feeling of unfinished business. 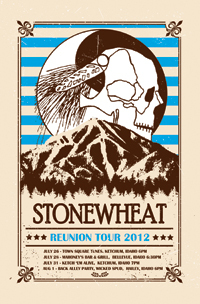 Facebook has facilitated some of the chances at resolving them, but for Stonewheat, it took recording an album and a mini-reunion tour. "When we broke up in 1997, we had this material that was ready to be our third album," said Johnny Valenzuela, who shared vocal duties with Brian Carney, and with whom he started playing at the Community School in the early 1980s. "I've always had it in my mind that one day, we needed to get all of these songs recorded and onto an album. Sort of like unfinished business. So the pair were joined by fellow graduates of Loyola Marymount University in Los Angeles, Steve Mackel, Steve Baur and Red, and the very first rock band to play in the nexStage Theatre, and a staple of New Year's Eve, got back together in the studio after 11 years and came up with "Not the Same." The CD will be for sale at the free shows, which start Thursday, July 26, with Town Square Tunes in Ketchum at 6 p.m., and continue Saturday, July 28, at Mahoney's Bar and Grill in Bellevue at 6 p.m. The band will open for Polecat, Tuesday, July 31, at 7 p.m. at Ketch'em Alive in Forest Service Park and end Wednesday, Aug. 1, at a benefit for Camp Rainbow Gold hosted by the Back Alley Party at the Wicked Spud in Hailey at 6 p.m.
And if this reunion leads to fame, "We've got families, careers, etc. If a label were to come knocking, the door's probably closed, but it's not locked, and there is a peephole in it." At Whiskey Jacques', Diego's Umbrella, labeled San Francisco's ambassadors of Gypsy rock, will perform to support its latest record, "Proper Cowboy." The band's press release calls it a hat tip to the raucous dance parties that the band played in its early days in Croatia, but quintessentially American as rock 'n' roll. The band worked for the first time with The Rondo Brothers, which has resulted in a captivating new spin on the world that the band has created with reverb-soaked guitars and Gypsy fiddles augmented by an army of tubas, analog synthesis and vocals. In summation: a futuristic spaghetti Western soundtrack with a sound like Flogging Molly and The Clash. The band plays at 9 p.m. and tickets are $8. If you were at Ketch'em Alive on Tuesday night, you got a taste of Billy Franklin's NOLA Live. Franklin will appear Thursday, July 26, at the Sun Valley Brewery's free Summer Block Party at 7 p.m. in Hailey. In the past few years, Franklin has been touring under his own name and was 2010's "Best Emerging Artist" at Gambit Weekly's "Best of New Orleans Awards." He brings a wealth of New Orleans talent to perform funk, soul and blues. Boise's Hillfolk Noir will perform country, rock 'n' roll, folk music they call Junkerdash or indie folk, at 3 p.m. Thursday, July 26, at Hailey's Farmers' Market on Main Street. Other events this week include the Sawtooth Summer Music Festival in Stanley on Friday and Saturday, and it's the final weekend of Jazz in the Park at Rotary Park in Ketchum, Sunday, July 29, at 6 p.m., with Tyia Wilson and friends. This story is just meant to touch on some of the unusual and is by no means fully representative of what's happening this week. For a more complete listing of all the valley's music as of press time, see the calendar on page C4.